Driving next to someone who slowly creeps over into the neighboring lane can be frightening. It’s difficult to know whether that driver is intoxicated, nodding off, or simply not paying attention to the road. A recent study examined the causes of so-called lane-drift car accidents, and the role that incapacity, distraction, or intoxication played in these accidents. The Insurance Institute for Highway Safety (IIHS) conducted a recent study on the causes of lane-drift, or lane-departure accidents. The study used data from a federal accident database to study over 600 lane-drift accidents where at least one vehicle involved needed to be towed from the scene of the accident. The researchers sought to determine the factors at play most often in fatal and non-fatal accidents. The IIHS researchers determined that 124 lane-drift accidents caused fatal injuries in 2014. In 34% of all crashes, driver incapacitation was a factor in causing the crash. Incapacitation was an even greater factor among lane-drift accidents resulting in serious or fatal injuries, a factor in 42% of all of these more severe crashes. 17% of accidents resulted from accidents where a driver had fallen asleep, and another 17% resulted from accidents where a driver had lost consciousness for another reason, such as drugs, alcohol, heart attack, seizure, or diabetic shock. 8% of these accidents stemmed from a driver with a blood alcohol level at 0.08 or above, but who had not lost consciousness. Victims of lane-drift accidents could be entitled to additional damages if the at-fault driver was incapacitated at the time of the accident. If that driver has never had a previous incident of sudden physical incapacity, or had no reason to believe they would lose consciousness behind the wheel, then courts would be unlikely to assign that driver with additional liability for getting behind the wheel. However, if the driver was aware that they were prone to experiencing sudden unconsciousness and could not or did not treat that condition with necessary medications, or was incapacitated by drugs or alcohol, then courts might find the driver liable for endangering other drivers by getting behind the wheel. An attorney can help you determine whether or not you might have a claim for damages against an at-fault driver who lost consciousness behind the wheel. The IIHS study also produced research which could prove useful in improving lane-departure warning technologies. Currently, most lane-departure warning systems use cameras and sensors to identify lane lines in the road ahead of drivers, and emit a warning sound to let drivers know when they’ve left their lane. 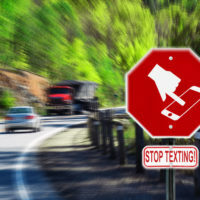 While this sort of warning could be useful in preventing distracted drivers from being involved in a crash by drawing their attention back to the road, these sorts of warnings wouldn’t prevent accidents involving incapacitated drivers. Increasingly, vehicle safety systems also include features which correct the car’s course so that they remain in their lanes. This technology might help prevent crashes with drivers who are unable to respond to a lane-departure warning. If you or someone you love has been injured in a lane departure crash in New York, find out whether you may have a claim for money damages by contacting the experienced, seasoned, and compassionate Manhattan personal injury lawyer Leandros A. Vrionedes for a consultation on your case, at 212-889-9362, or in Astoria (Queens) at 718-777-5895.